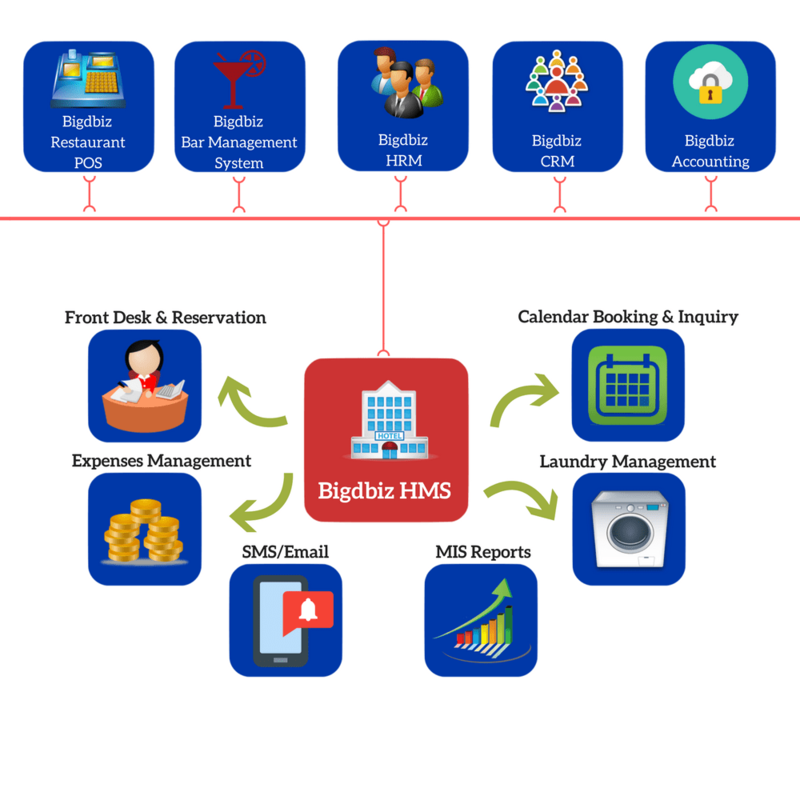 Bigdbiz Hotel Management system is designed to accommodate the needs of various types of properties like the hotels, motels, resorts, clubs, B & B's, small hotel franchisees, clubs, condo's, hostel and apartments. It has a whole range of integrated modules to cover every aspect of property management. 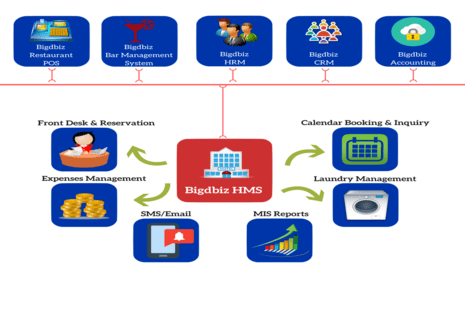 Bigdbiz Hotel Management system is also beneficial to its users who can be a Director, General Manager, Front office or Reservation Manager in performing their duties efficiently as the software offers a wide range of modules to smoothen the Operations process and also offers numerous reports to help them analyze their work. Bigdbiz HMS notifies the status of Room like Reserved, Blocked, Clean/Unclean, Available etc. The Guest Checkin/Out details, Advance booking person details with thier arrival date and time etc. Revenue projection in Chart details. 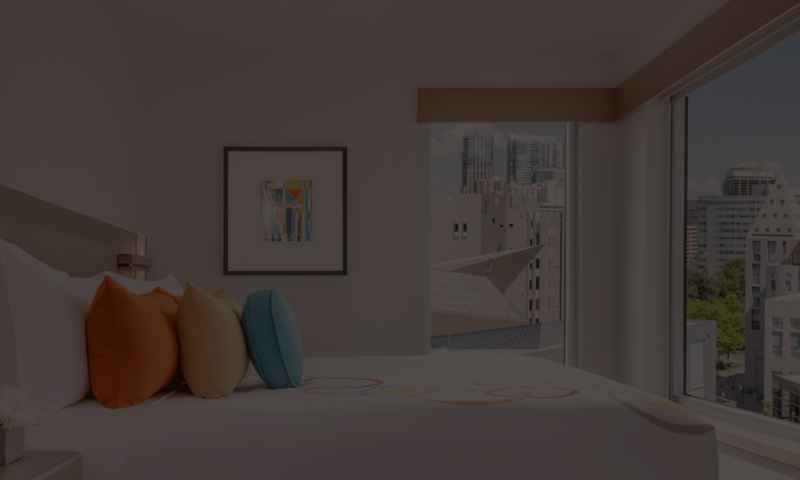 Our HMS allows user to set multiple rate tariff for a single room for mapping on various season. Convert AC room to Non-AC, set tariff as on. Create multiple rooms at a time with a room series formed. Bigdbiz HMS generates reports for Night Auditing on the Day Closing. User can submit reports to admin for Auditing purposes. Credit Billing and Pending payment is handled in Bigdbiz HMS. The pending due from user can be easily tracked and can be paid on receipt. Alert on pending due will be notified, even when the customer arrives next time. View in-depth reports about the total revenue generated happening at your Property. View Daily/Weekly/Monthly/Annual Transaction reports, Room-wise / Type-wise reports etc to get a better grasp of your Hotel business. Being at one place you can manage and track the function of Branch. Can control even when yo are remote from the location by the web-based feature. You can control his business with his Mobile/Tablet/Laptop from anywhere. Get SMS/Email alert on checkin/checkout. Create a special connect with your customers by sending them customized greetings on their birthdays and anniversaries. Export report in different formats such as .xls, .pdf. Applying season/multiple Rate for each room.